Outdoor play is crucial to children and provides so many great benefits! Exploration, risk-taking, fine and gross motor development and the absorption of knowledge are just a few of the benefits of taking your child to the playground. In addition, your child will be participating in physical exercise, learning healthy habits, and enjoying simply being a child. Below are some great ways to engage with your child on your next park visit (click here for some ideas on things to say to children while you are there!). 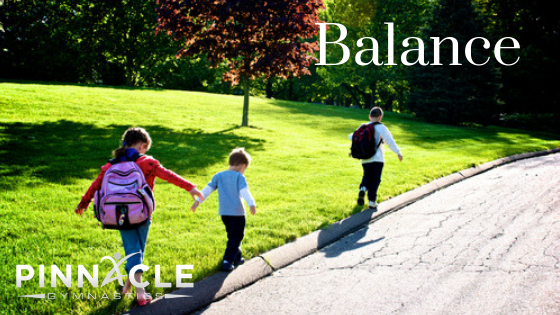 Balance is important for your child's physical development. Being outdoors provides many excellent opportunities to work on balance. Challenge your child to work on their gross motor skills by walking forward or backward on a log or the curb. You can also increase your child's vestibular system involvement by encouraging them to slide and swing. Improving your child's vestibular system helps them to coordinate movement with balance. Grab your sidewalk chalk and get hopping. 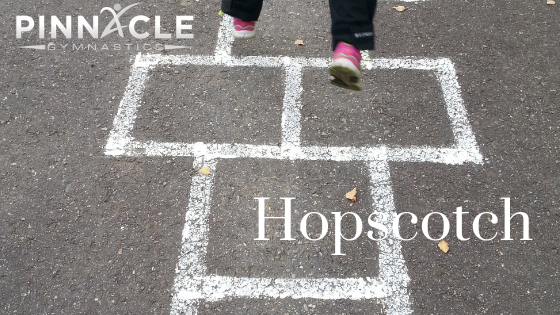 Did you know that hopscotch helps your child to develop body control, strength, spatial awareness, and rhythm? These are are just a few of the benefits of hopscotch for your child's development. You can play the traditional way, or modify. Hopping on one foot is a challenging skill, it typically develops around the age of four. For younger children, have them hop with their feet together in the single boxes, and feet apart in the double boxes. You can also eliminate the hopping by simply calling out a number and have your child find the number and stand on it. Strengthens musculoskeletal tissue, resulting in stronger bones, muscles, and joints. 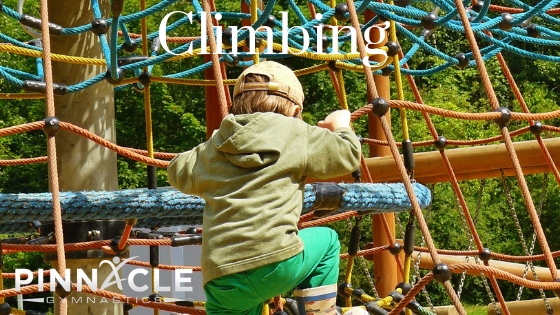 Equally as important, climbing helps your child to set goals, overcome fear, and build confidence. Children need the opportunity to participate in healthy risk-taking activities in order to develop physically and mentally. Next time you are at the playground, help your child find spots to climb vertically, horizontally, and on both flexible and hard surfaces. 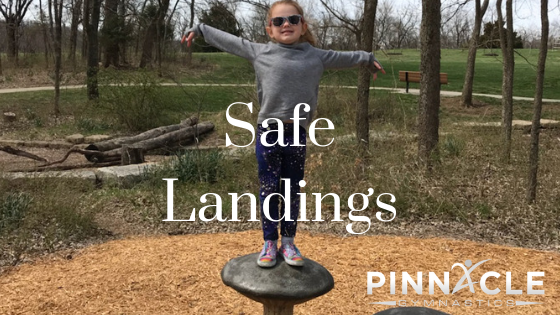 Educate your child about the importance of safe landings, landing on their feet with their knees bent. You will also need to educate your child on the importance of safety falls, falling backwards and rolling rather than reaching back with their arms. Once you have demonstrated and practiced safe landings with your child, make a game of it. Play the "five for fives" safe landing game. Anytime you see your child perform a safe landing, reward them with a high five. Count how many high fives they can get. Can they beat their record from the last time? Ask your child, "What should we do next?" Encourage your child to listen to the birds and mimic their sounds. Learn about nature together. Explore texture, size, and color. Make comparisons between trees and flowers or one slide compared to another. 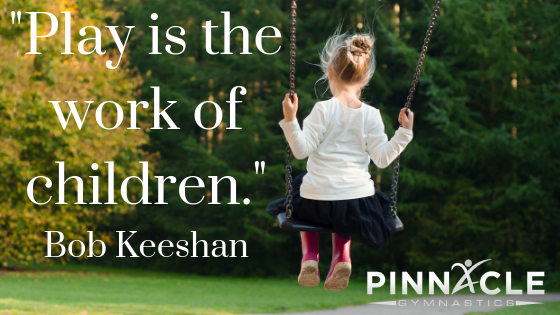 Get up and move with your child; climb, slide, run, and jump. Play a movement game. Try Simon says or Mother May I. Play pretend. Be a pirate in the ship or a monkey in the tree. Next time you are at the park, know that whatever activity you choose to participate in is time well spent. 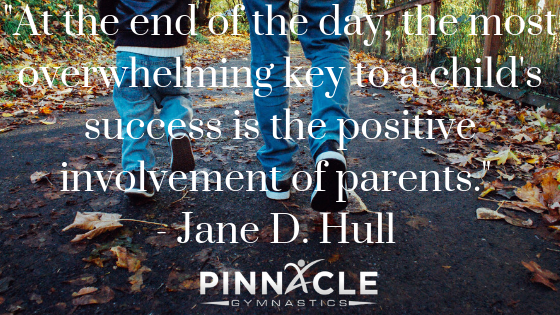 You are helping your child to learn through movement, risk-taking, and observation. You are also promoting a healthy and balanced lifestyle. Outdoor time = great times!